These Lemon Poppyseed Waffles are bursting with flavour! They’re drizzled with a divine vanilla blueberry sauce, and are vegan and gluten free! This post is sponsored by Nielsen-Massey. All opinions are 100% mine. Thank you so much for supporting brands that support Jessica in the Kitchen! Okay, so the question of the century: are you a waffle lover, or a pancake lover? Personally? I love both. If I had to choose, I would definitely choose waffles. I love the texture differences and the fact that you can get both a fluffy and slightly crisp breakfast in one. Texture dreams completed, basically. 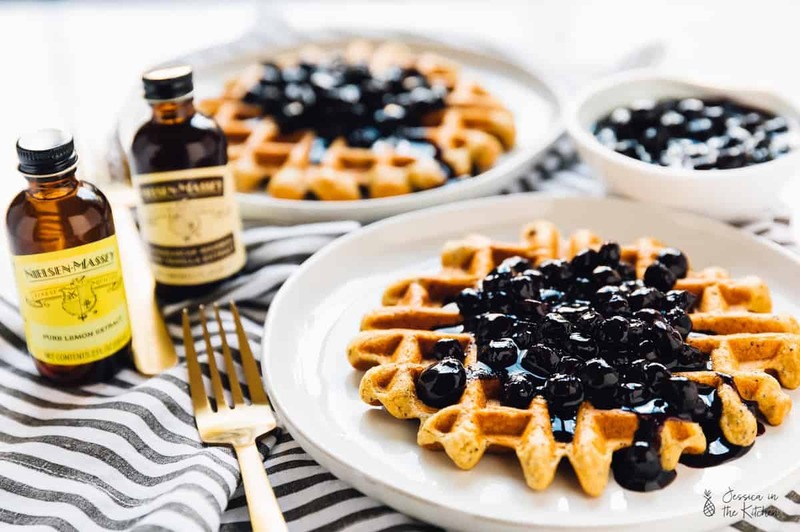 I realised I haven’t made a waffle recipe for you guys in quite a while, so I made these Lemon Poppyseed Waffles with Vanilla Blueberry Sauce for you. Oh, yes, it’s just as amazing as it sounds. Also, they are vegan and gluten free. Christmas just came early. Let’s break down the waffles, then the vanilla blueberry sauce that you’re about to put onto everything possible. I’ve been wanting to tweak my waffle recipe for a while, and I really pulled off quite something with these. I wanted a gluten free waffle that doesn’t ‘taste’ gluten free, and a vegan waffle that should not be ever identified as ‘vegan’ in taste. 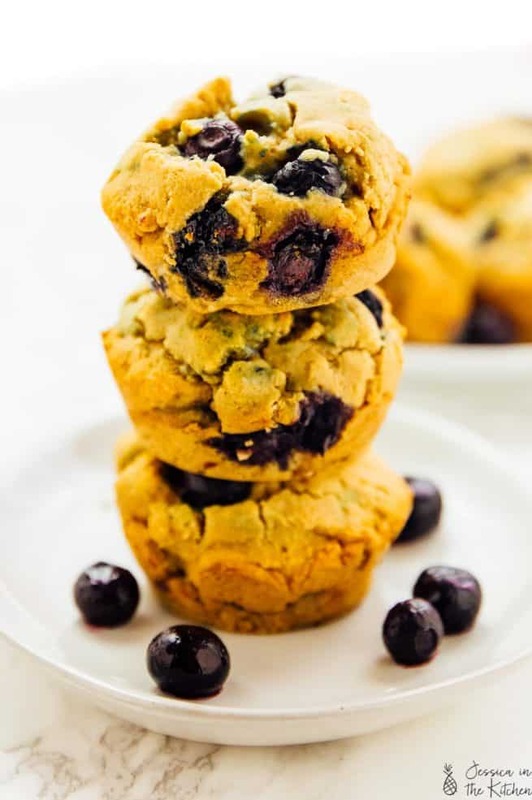 To do that, I used a mix of oat flour and gluten free flour, which really diversifies the texture, and I also kept the ingredients incredibly simple. The texture is unbelievably close to the kind of waffles you’d have at a restaurant, and the kind you’re going to want for breakfast every morning. Of course since we’re in the heart of spring, and everyone loves spring flavours, I wanted to add that to these waffles. For this recipe, I used Nielsen-Massey’s Pure Lemon Extract to bump up the waffle flavour with a divinely lemon-y flavour that really took it over the top. I also used Nielsen-Massey’s Madagascar Bourbon Pure Vanilla Extract, because waffles need vanilla extract friends, and they need the best ones. You guys already know that if I stand behind a product, it’s because I love and believe in it. Back in my baking days, I only used Nielsen-Massey’s Madagascar Bourbon Pure Vanilla Extract. I specifically remember ordering the largest size they had on their website, waiting excitedly for it to arrive, and then taking care of it like it was my child. It kind of was. 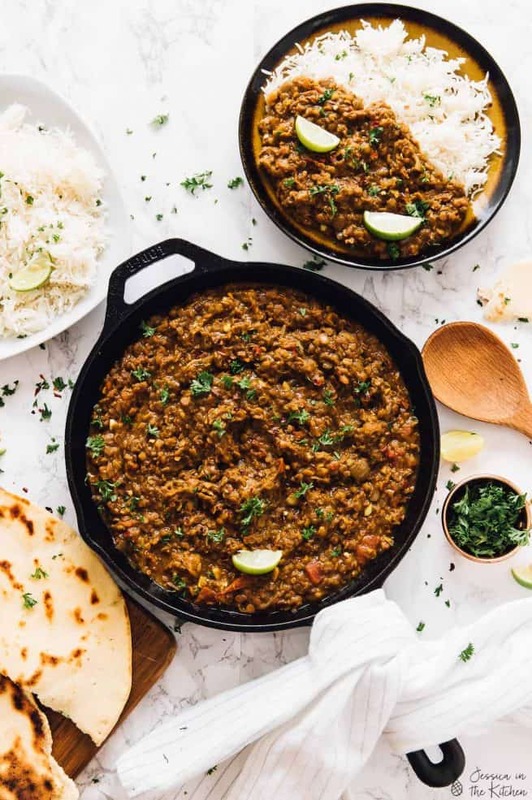 All Nielsen-Massey’s products are all-natural, GMO-free, certified gluten-free, certified Kosher, and allergen-free, so know that they work perfectly with our little family over here on JITK. After the bottle finished? I ordered more, and well, true story, I kept the bottle. It was just too pretty to toss and so I literally kept the bottle until I moved out of my parents’ house. So, needless to say, I love Nielsen-Massey’s products, and the high quality that they put into their vanilla-cultivation process and to craft their all-natural pure flavours. All vanilla is grown within 10-20 degrees of the equator and most vanilla beans available today come from Madagascar, Mexico and Tahiti. The entire vanilla-cultivation process, from planting to market, can take from five to six years. Following harvest, beans must be cured before use. Then, for two weeks, farmers spread the beans in the hot sun during the day and wrap them in blankets to sweat at night. The beans are conditioned on racks for an additional two weeks, and finally, beans are aged for 6 to 8 months in wooden boxes to allow the complex flavour notes to emerge. Nielsen-Massey also uses as few ingredients as possible when producing their pure vanilla extracts to create the highest-quality product available. This process leads to why their products are pretty much perfect. I specifically chose the Madagascar Bourbon Pure Vanilla Extract since not only was it the very first Vanilla Extract I tried almost 10 years ago, but also because vanilla from Madagascar has a sweet, creamy flavour with velvety after-tones and makes for an excellent “all-purpose” vanilla, perfect for any sweet or savoury recipe. That means it was the perfect choice for these waffles. Now that blueberry sauce! I’ve been making it for years, and decided I wanted to re-share it with you guys. It gets slightly thick, enough to coat your waffles, and has the most divine Vanilla flavour. Since blueberries and lemon pair so well, I also used both Nielsen-Massey’s Madagascar Bourbon Pure Vanilla Extract and their Pure Lemon Extract in the sauce. P.S. – if you sneak some of this, it’s pretty obvious since the blueberries turn your tongue blue. Take it from someone caught in the act of sneaking more blueberry sauce, you know, just saying. Now, the Pure Lemon Extract. To craft all-natural pure flavours, Nielsen-Massey starts with premium ingredients sourced from around the world. Made from California lemon oil and rounded out with peel notes, their Pure Lemon Extract is a fantastic “helper” ingredient to have on hand for the times a splash of citrus is needed. 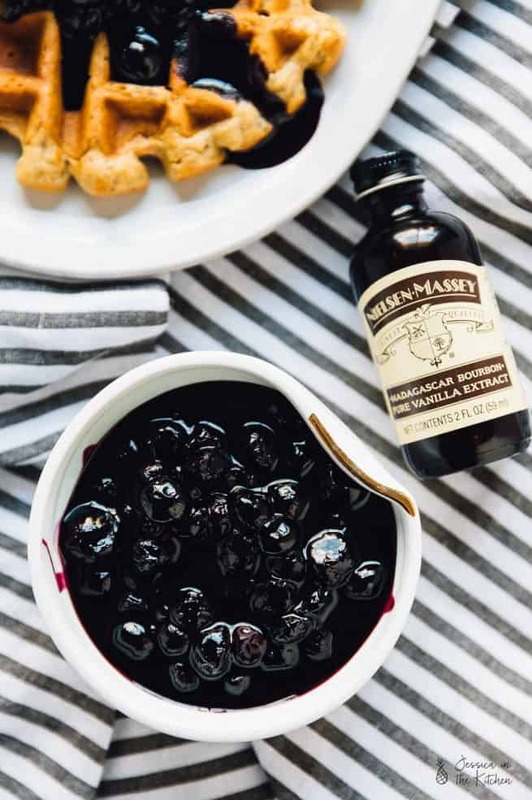 Nielsen-Massey uses a proprietary process to gently extract the delicate flavour without losing any of the sweetness or richness of the original ingredient. This process means that’s why with only a teaspoon and a half of lemon extract, you get those divinely subtle notes throughout the entire waffle recipe! I hope you enjoy the waffles friends! Happy eating! 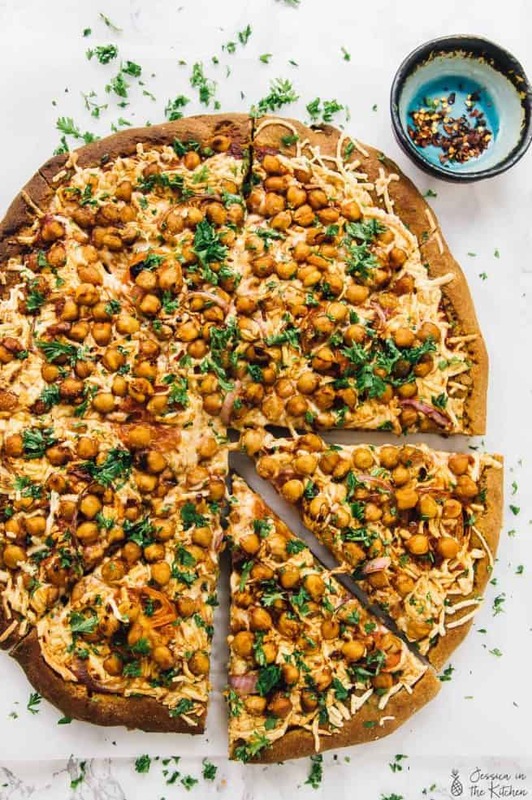 P.S friends – make sure you follow Nielsen-Massey on social media for even more recipe inspiration!! Mix the almond milk and apple cider vinegar together. Let sit for at least 3 minutes to create a vegan buttermilk. In a large bowl, mix the oat flour, gluten free flour, baking soda, baking powder, sea salt and poppy seeds together. Set aside. In a smaller bowl, mix all the vegan buttermilk, the melted vegan butter, the maple syrup and the Nielsen-Massey Madagascar Bourbon Pure Vanilla Extract and Nielsen-Massey Pure Lemon Extract. Pour the wet ingredients into the dry and mix until combined. Preheat your waffle iron in the meantime and grease according to manufacturer's settings. I set mine two dials before max because I like mine crisp but also very fluffy. Using a ½ cup/125ml measuring cup, scoop out some batter and pour/spread into the middle of the greased waffle maker. You don’t need to push it to the edges. Close and let cook until the steam has COMPLETELY finished to rise from the waffle maker. Otherwise the waffle will fall apart. Don't open it before the steam is finished! 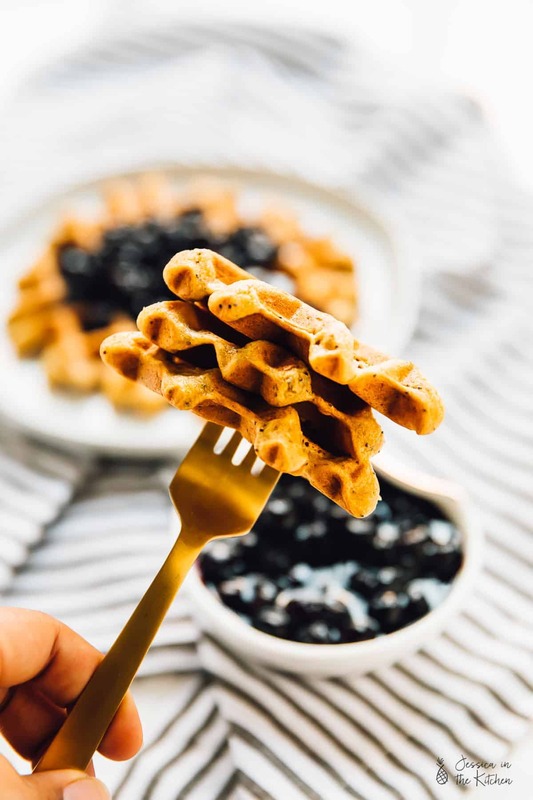 Remove each waffle and place on a baking sheet in your oven or toaster oven on "warm" or 200F/95C to keep warm and crispy until finished with the entire batter. Continue with the rest of the batter. 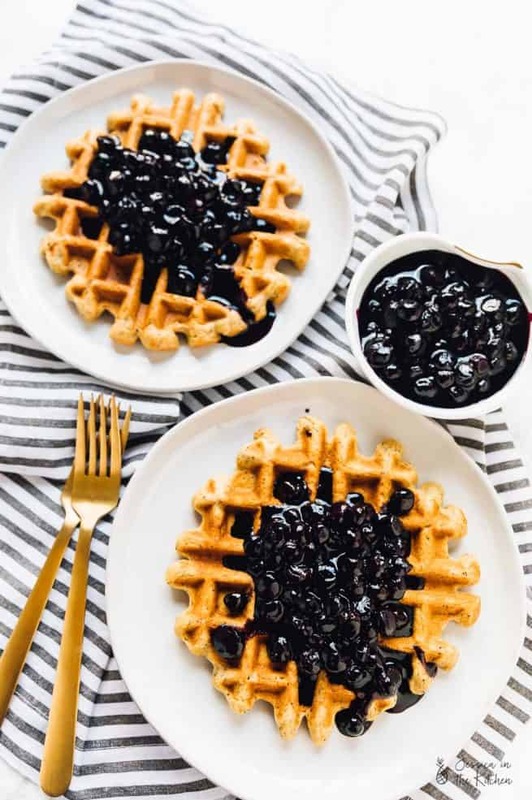 While the waffles are being made, you can prepare your Vanilla Blueberry Sauce. Add all the ingredients to a pot over high heat. Bring the ingredients to a boil until blueberries begin to pop, and then reduce to a lower heat for 10 minutes, until the sauce begins to thicken. Feel free to add more cornstarch slurry if you want your sauce much thicker. 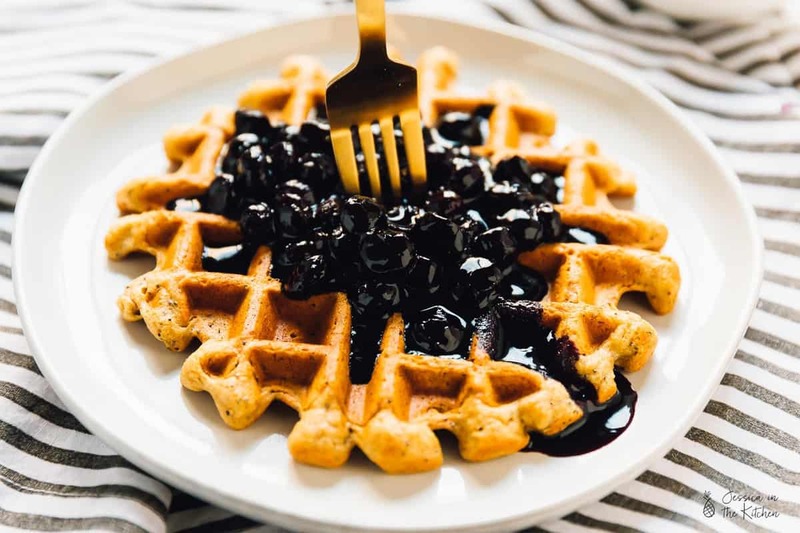 Serve the waffles with the vanilla blueberry sauce and enjoy! These look so amazing! 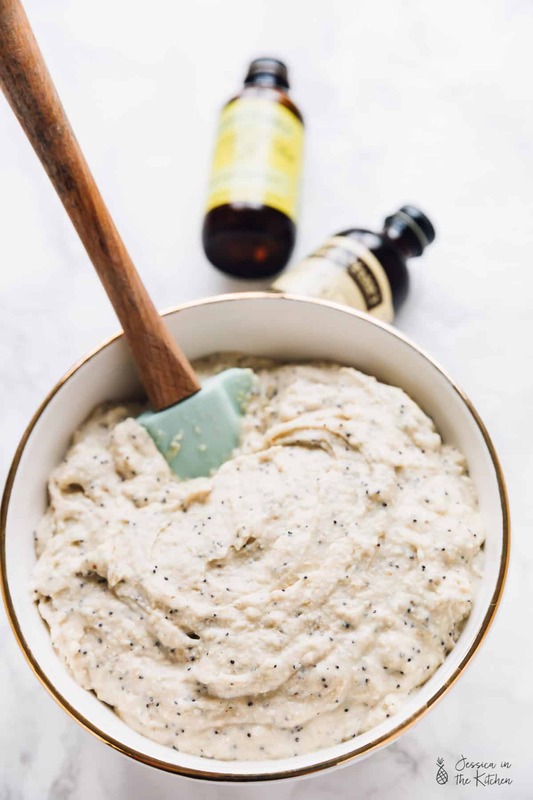 I LOVE lemon poppyseed anything so I cannot wait to try this. Blueberries are always such a great addition to lemon anything. Mothers Day has come early for me! Lemon poppyseed is a favourite of ours as well! Thank you for your kind words and Happy Mother’s Day when it comes Andrea!!! Hi Jess! Thanks for the comment. It’s all we use over here! It really is a good flavour! Thanks so much!! I hope you enjoy! Looks so yummy!!! I will try doing this tonight for my kid. Thanks for your article!